Do you suffer from PMS? Period pain, cramps? Mood swings – cry for no reason, sensitive, angry, feeling low, depressed, indifferent, antisocial? Low self esteem? Sensitive to stress? Insomnia? Weight gain? Fatigue? Difficult to concentrate? Hard to breathe? 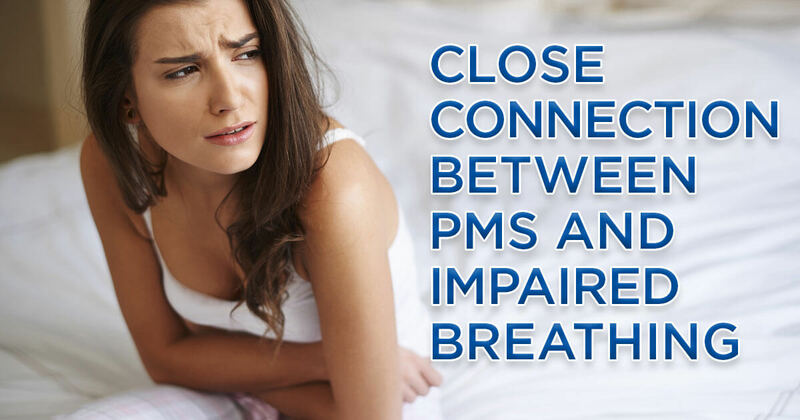 If so have you ever thought about how you breathe when you suffer these PMS symptoms? There is, in fact, a very close link between impaired breathing and problems associated with menstruation. Answer the 20 questions in the Breathing and Healthindex to get an idea of your breathing habits. Don’t be surprised if the result shows that you have a breathing with great potential for improvement. The hormone progesterone effect the breathing. During day 15-28 in the menstruation cycle the progesterone levels are normally higher. High levels of progesterone increase the breathing and therefore also the outflow of carbon dioxide. About one week after ovulation and a few days ahead, the carbon dioxide levels are at their lowest. This reduction can contribute to PMS problems, as lower carbon dioxide content is associated with worsened oxygenation of the body. In addition, if the carbon dioxide content, due to a stressed breathing, is already lower than normal during ovulation, increased progesterone levels result in even lower carbon dioxide levels. Normally women feel at her best day 1- 14 in the menstruation cycle, which coincides with the highest levels of carbon dioxide in the blood (and progesterone levels at their lowest). The last week of the cycle is usually the worst. That’s when the carbon dioxide level is at its lowest (and the progesterone level at its peak). Even though the brain and nervous systems only make up two percent of the body weight, they use up to 20 percent of the oxygen we consume. If our breathing is worsened, our body will lack oxygen. The brain is then the organ who suffers the most. When the available oxygen is limited, the brain will work a bit slower. 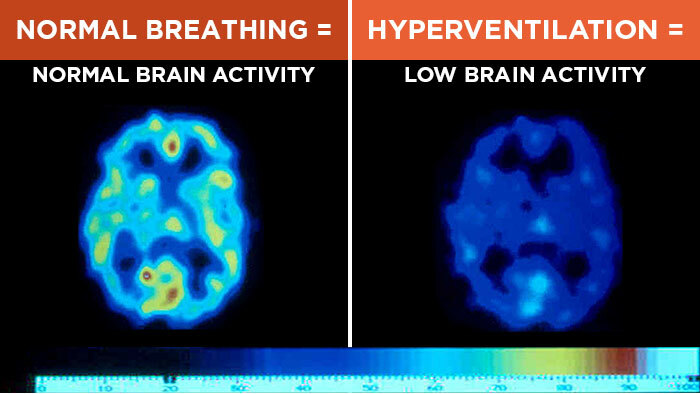 The picture on the left shows brain activity during normal breathing and the picture to the right after one minute of hyperventilating. The more colorful, red, yellow, green, the more activity. After one minute of hyperventilation the brain activity has decreased significantly due to hyperventilation causing lack of oxygen. Hyperventilation is a natural reaction from stress and means that you breathe fast. The problem arises when this stress response is triggered at rest, the breathing will then become faster than our bodies requirements. A lot of the stress we experience in our day to day life isn’t followed by any physical activity and therefore it is very common that our breathing equals a lowgrade form of hyperventilation, although not as bad as the picture above, but when this over breathing is repeated hour after hour, day after day, over time it has major negative impact on our brains ability to work. What happens when we become scared, worried? “Help, a tiger”, “Aaah, an annoying text message”. We gasp for air, right! The frightened feelings we have at the dentist, at the hospital when we’re getting an injection or when we see a spider, normally makes up gasp for air, tense up and “freeze”. The saying “Now that the danger’s over, we can relax and breathe out again”, really proves the point. Of if we’re going to hold a speech at a wedding and are a bit nervous, we often tense up and breathe faster and higher up in the chest. Unpleasant feelings are often situated in the stomach area, which sayings like “butterflies in your stomach” verifies. When we move up our breathing into the chest it’s like we are running away from our fears. This reduces the movement of the diaphragm, our most important breathing muscle, which gives the uncomfortable feelings an opportunity to grow and become even bigger. When this coincides with low levels of carbon dioxide, life can seem like “stormy waters” with heavy mood swings. A good example of the major impact of carbon dioxide on our oxygenation is in panic attacks and fear of flying. It’s common to then breathe in a bag, so part of the air you breathe in is re-inhaled. Exhaled air contains a lot of carbon dioxide and when we breathe this air back in we naturally raise the carbon dioxide levels in our body. Which results in the person with panic attack or fear of flying gets calmer. It almost always work as carbon dioxide is the body’s natural tranqualizer. With our breathing we can either enhance or reduce the pain. When we tense up the pain increases. An expression used in correlation to childbirth is the “fear-tense-pain”-cycle. The women who’s giving birth is anxious about the labor and tense up. A tense body enhance the pain. Read more in the article: Your Breath – A Powerful Tool For Pain Relief. Breathlessness means that the breathing has successively become worse, to the point where it’s so hard to breathe you feel breathless. Here is a post from the American site MedHelp: “Shortness of breath during menstrual cycle”. – I too experience shortness of breath and I also get weak and dizzy. I am an athlete (did a half ironman last year) and nearly pass out walking up one flight of stairs during my period, am actually finding typing this tiring. Would really like help with this if anyone has an answer, get no joy from the Dr.
– I have the exact same thing! I also get shoulder pain on the left side if I work out during this time. I have had this happen every month just after ovulation for the past 10 years. Very frustrating because, like all of you, my dr. thinks I am crazy. It lasts for about 3-4 days and then I feel much better. – OMG! I’m not alone! I have been suffering from breathing difficulties for over 4 years now that feel like I just cannot get enough air. I try to make myself yawn to feel ‘satisfied’. Doctors say my lungs are fine, no asthma. When I finally started realizing that the breathing difficulties came with my period I told various doctors and they just look at me like I’m crazy. But now I know I’m not crazy! It can last up to a week and can be very intense usually during, but sometimes right before my cycle. Then it goes away for about 20 days, until the next cycle. To improve your breathing is a simple and often overlooked way of both increase fat burning and improve digestion and thus lose weight. In the conversion of nutritions to energy, the nutrients mainly consists of fat and sugar. 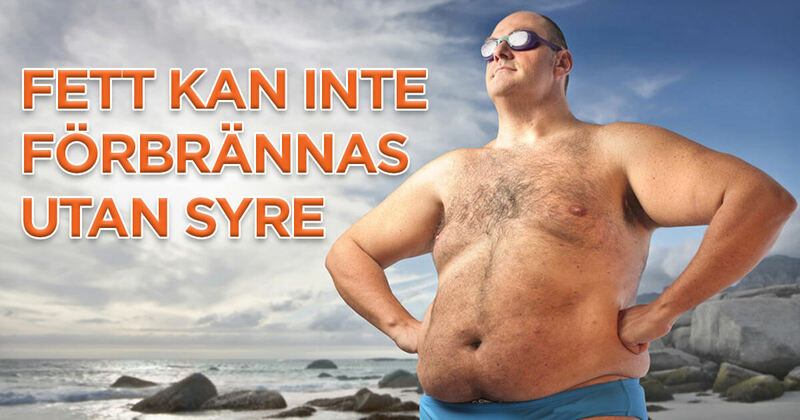 Oxygen has to be available for fat to even be burned at all. During ineffective breathing less oxygen reaches the cells. The worse our breathing is, the more we close the door to our fat reserves. When we don’t have full access to our fat reserves we’re forced to use a larger portion of carbohydrates than normal. When we overuse sugar as fuel the relatively small amount of carbohydrates, stored in the body as glycogen, run out faster than it should and we experience sugar cravings. In addition, a low diaphragmatic breath massage the stomach, liver and intestines with every breath, whilst a shallow breath doesn’t give this stimulation and it becomes harder for us to digest the food we eat. These days it is common that women are estrogen dominant, which means too low levels of progesterone and too high levels of estrogen. During stress, the production of the stress hormone cortisol increases. When cortisol and progesterone compete for the same resources, the progesterone levels decrease. We can compare it to a woman in a warzone, which means she’s under a lot of stress. Logically, survival is prioritized over reproduction. Contraceptive pills also lower the progesterone levels in the body. They contain synthetic progesterone (gestagen) that doesn’t work on the same way in the body as natural progesterone. Estrogen is a growth hormone given to cattle to grow faster and produce more milk. So when we eat beef and dairy products we consume estrogen. In addition, there’s Bisphenol A in many plastics. Bisphenol A is one of the world’s most produced chemicals, and as it is similar to estrogen, problems occur in the body when exposed to this substance. Bisphenol A is found in almost all urine samples from humans, indication that we constantly are exposed to this substance. This occurs mainly through food and drinks that has been in contact with polycarbonate plastic or epoxy, since residue of bisphenol A may leak from these materials. Too low levels of progesterone and too high levels of estrogen is a possible reason bioidentical progesterone cream helps many women. Improving your breath to reduce stress and thereby increase the production of progesterone is also a powerful way to balance estrogen and progesterone. The 7 Step CBR Program to Better Breathing. Follow the training program during the course of four weeks to take your breathing habits to the next level. Sleep with your mouth taped at night. Mouth breathing at rest means over breathing and oxygen deficiency, which leads to a stressed nervous system and a worsened deep sleep. When we start sleeping with our mouths closed our oxygenation improves and the brain becomes calmer and sleep becomes deeper. The Relaxator Breathing Retrainer. The Relaxator is a perfect tool to help you get a slower, lower, smaller and more rhythmic breathing. Physical activity with closed mouth. Our body is created for movement and moving whilst keeping our mouth closed is a very effective way to increase the carbon dioxide pressure in our body and thus oxygenate the body fully. Title Central neural mechanisms of progesterone action: application to the respiratory system. Journal J Appl Physiol (1985). 1992 Aug;73(2):393-404. Author Bayliss DA1, Millhorn DE. Abstract Around the turn of the century, it was recognized that women hyperventilate during the luteal phase of the menstrual cycle and during pregnancy. Although a causative role for the steroid hormone progesterone in this hyperventilation was suggested as early as the 1940s, there has been no clear indication as to the mechanism by which it produces its respiratory effects. In contrast, much mechanistic information has been obtained over the same period about a different effect of progesterone, i.e., the facilitation of reproductive behaviors. In this case, the bulk of the evidence supports the hypothesis that progesterone acts via a genomic mechanism with characteristics not unlike those predicted by classic models for steroid hormone action. We recently, therefore, undertook a series of experiments to test predictions of those same models with reference to the respiratory effects of progesterone. Here we highlight the results of those studies; as background to and precedent for our experiments, we briefly review previous work in which effects of progesterone on respiration and reproductive behaviors have been studied. Our results indicate that the respiratory response to progesterone is mediated at hypothalamic sites through an estrogen- (E2) dependent progesterone receptor- (PR) mediated mechanism requiring RNA and protein synthesis, i.e., gene expression. The E2 dependence of the respiratory response to progesterone is likely a consequence of the demonstrated induction of PR mRNA and PR in hypothalamic neurons by E2. In short, we found that neural mechanisms underlying the stimulation of respiration by progesterone were similar to those mediating its reproductive effects.